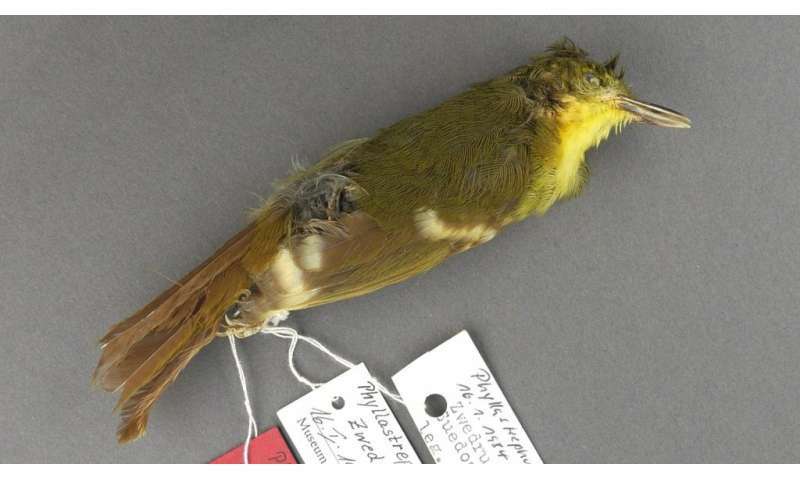 The Liberian Greenbul (Phyllastrephus leucolepis) has eluded experts for decades after it was spotted in a forest in the West African country in the early 1980s. The only specimen that exists differs from the commonly found Icterine Greenbul by the distinctive white spots on its feathers. The Liberian Greenbul has long been one of the world's most poorly known bird species and was listed as Critically Endangered up until 2016. Now DNA analysis by experts at the University of Aberdeen has concluded that the Liberian Greenbul is most likely an unusual plumage variant of the Icterine Greenbul, possibly caused by nutritional deficiency while the feathers were growing. The study, published in the Journal of Ornithology compared DNA from the Liberian Greenbul specimen with DNA from the Icterine Greenbul and others and found there was no significant genetic difference between Icterine and Liberian Greenbuls. Comparatively, studies of other species of greenbul revealed large genetic differences between different species, suggesting the lack of difference between the Icterine and the Liberian indicates they are the same bird. "The Liberian Greenbul has gained almost 'mythical' status since it was sighted in the '80s, says Professor Martin Collinson, a geneticist from the University of Aberdeen's Institute of Medical Sciences. "We can't say definitively that the Liberian Greenbul is the same bird as the Iceterine Greenbul but we have presented enough evidence that makes any other explanation seem highly unlikely. The genetic work was performed independently by scientists here in Aberdeen and in Dresden to make sure there could be no error – we both came to the same conclusion." The Liberian Greenbul was seen on nine occasions between 1981 and 1984 in the Cavalla Forest in Eastern Liberia. The only known specimen was collected in January 1984 and described as species 'new to science'. The devastating civil wars that subsequently engulfed the country prevented any serious attempt by ornithologists to find any more individuals for another 25 years. Targeted searches of the two known sites in 2010 and 2013 failed to find any sign of the bird, meaning the Liberian Greenbul had never been seen since the only known bird was shot. The Cavalla Forest is of global conservation significance and was recognised as an important bird and biodiversity area by BirdLife International, not only for the Liberian Greenbul but also for the presence of other globally threatened bird species, including the Vulnerable White-breasted Guineafowl and Brown-cheeked Hornbill and mammals such as Chimpanzee, Western Red Colobus Monkeys and Pygmy Hippopotamus.